The costs to implement a sweeping new software system have started to drag down earnings at Partners HealthCare, the state’s largest network of doctors and hospitals. Partners finished the fiscal first quarter ended Dec. 31 with operating income of $12.8 million, down from $74.1 million a year earlier. Overall, Partners lost $37.5 million because of investment losses, reversing a net gain of $40.6 million the year before. Chief financial officer Peter K. Markell said Partners expects a $200 million hit to profits over three years from the expenses tied to implementing the new electronic health records system. The system, purchased from Epic Systems Corp. of Verona, Wis., requires not just new software and hardware, but intensive training for every employee who uses it. Partners hired 600 employees, as well as hundreds of consultants, to launch the system. Partners’ revenue in the quarter grew 6 percent to more than $3 billion. But operating expenses rose 9 percent on higher spending for wages and benefits, pharmaceuticals, clinical supplies, and medical insurance claims. Brigham and Women’s Hospital lost business when it implemented Epic software in 2015, because the hospital had to reduce its schedule while employees got used to it. 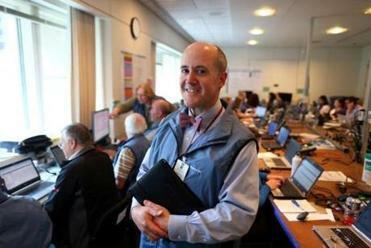 Massachusetts General Hospital also plans to reduce its schedule when it launches the program this year. Meanwhile, finances at Partners’ insurance subsidiary, Neighborhood Health Plan, continue to stabilize after two years of severe losses, but Neighborhood still lost $12 million on operations during the quarter. Partners includes Brigham and Women’s, Mass. General, and eight other hospitals, as well as some 6,000 doctors.